I love the Absolute Write Water Cooler site and its fabulous forum HERE, where you can connect with writers whose interests range from nonfiction to any genre of fiction you can imagine. There are fun writerly opportunities, too; I especially enjoy chiming in on Chain Chain Chain of Haiku Fools. Recently, I was reading through the Writing Novels Forum and stumbled upon a post titled Are any of your projects ‘bigger’ than you are? Are any of you working on (or have you published) a book of such a grand scale that when writing it, it seems that the project is way too much for you to accomplish? Yes, I have a big story that tortures me on a regular basis. Thing is though, these stories are gifts, at least in my opinion. You probably have a highly unique concept and if you tried to leave it to write something, uh ordinary, you’d feel the pull of that original idea anyway and tune out your new story. I think you should try writing your big story in layers. Structure your plot scene by scene in an outline, making sure you have conflict and that each scene is progressing your story. Then get down the dialogue, some of the setting basics. Go back later to add thematic elements and color (as in descriptors relating to the five senses, quirky personality bits, humor, etc…). Let the first draft of your singular story be crappy. Allow your idea to stretch you as a writer without giving you stretch marks. I, personally, wouldn’t give up on it. This world needs more standout stories. Just my 2 cents! Days later now, and I’m still thinking about that post. How, I wonder, did Michelangelo feel when faced with the ceiling of the Sistine Chapel? I only dabble in art, but I know that every idea has to start with a single scratch of pencil to paper or paint to canvas, and there is always a moment (at least for me) when the work looks like someone slopped raw sewage on the page, maybe with a little blood. You have to continue through that drecky phase to find the magic. Draw everything out, add depth with more markings, add the color, layer the color, presto chango…beauty. Roses from the refuse. Yes, there’s a wide canvas to fill when you’re working on a big story concept, and you’ll need plenty of organization and craft skills to tackle it. But if you have a story–of any size–that has you by the guts, I think you have to write it. Believe in your abilities to carry you through the rough patches. Love yourself more than your story, because otherwise you will always be lost in its shadow. And understand that no one–not Stephen King, not John Steinbeck, not Maya Angelou, Toni Morrison or Audrey Niffenegger–can write your story the way you can. If Michelangelo had turned his sketches over to someone else, do you think the final product would’ve been as extraordinary? I doubt it. I think the art needs the visionary in order to fully actualize. We’re all learning here. We’re all on a journey. But I won’t let the white of the canvas blind me into thinking I can’t splash it up with color; I won’t let it intimidate me out of writing my story. Could my big story stink big in the end? Sure, it could. I hope it doesn’t, but it could. My goal is to tackle the canvas daily, add my pencil marks and brush strokes, continue to learn and grow as a writer, and hope that my confidence grows big and fat along with my bank of knowledge. Until then, the daily struggles continue. Anyone else have big story issues? Issues of any size that you battle on a regular basis? What do you do to keep your confidence up? p.s. On a personal note, guess what came in the mail this week? I finally have my official certificate – my master’s degree! WhooHoo! Or should that be WUWUW? Write on, all! Yeah, my stories are probably too big because I’ve been working on 3 of them simultaneously. They are interconnected in that some of the events overlap. Yeah, yeah, I should have done something ‘simple’ but ironically, that’s why I have 3 stories now instead of one. Last year when I was about to dive into NaNoWriMo, I realized I didn’t want to use my ‘main’ story in case the whole thing ended in disaster (which it kind of did), so I created a new character and a new story set in the same universe. But rather than simplify things by creating a ‘practice’ story, now I’ve got 3 instead of 1. That’s ok though, the 2nd story I’m going to crank a draft for this year’s NaNo… and the original story? The original story is now the 3rd story. The thing is, this is not a trilogy. These are all the beginning adventures for each respective character, so one way of looking at it is that I’m launching 3 trilogies. Yes, I truly am crazy and in over my head on this one! It’s not that I think I have some amazing idea or concept or anything like that, but I have a good idea for a novel. The problem is that I feel way too inexperienced to write it. What if my novice writing ruins a great idea? Will I ever come up with another one? In the end, it seems you can never know which one will be the great one. Kind of like my wife. As long as I keep writing what “has me by the guts,” the great one may already be right in front of my face. 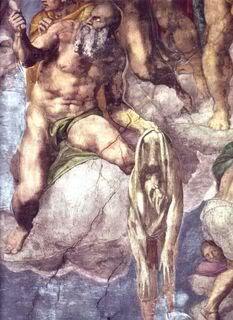 ter, beautiful essay – your analogy to one’s big story and michaelangelo was spot on. Eric, my story started as a trilogy concept, too. I was halfway through story #2 when the comments came in for story #1. I had to stop and think through what I really wanted. I decided to give story #1 an Extreme Makeover. Once that’s finished, I may go back and see if I can save the trilogy concept, but for now this single story is keeping me busy. Arthur, flash and short-story experimentation can be a great way to hone your writerly skills while still working on the Big One. I do think working up a story outline is a good way to see the bones of your story before investing too much time on it – to be sure everything is working as it should. Just my 2 cents. Congratulations on the degree, Therese! I think your advice was spot-on. Every big story was written in doable (for its author) chunks. I have a “big” story on the back burner at present. It not only seems like a very special idea but it also is calling out to be in first person, which I’ve never done before. But it’s mine to write. WHOO HOO on the degree, Teri! Though I wouldn’t compare my scratchings to Michelangelo, I do feel like every day at the keyboard is like chipping away at stone to reveal . . . something. Each word is a tap of a chisel. At least, that’s how I envision it. So at the end of the day it’s either an ashtray or the Pieta. Unfortunately, I’ve written a lot of ashtrays. YOU ROCK, TERI! Congrats on the degree! I’m so proud of you!!!! I have a big story idea, too, that I really want to do, but it terrifies me at the same time because I just don’t know if I can pull it off. I’d like to try, though. My first story has that feel to me, of being too big for me, and it’s only grown as I work on it. It’s overwhelming sometimes. I just do a little at a time while my abilities improve, and work on other things when I just don’t know what else to do on it. But this is the story that got me into novel-writing, and even if it’s never published, it’s been more than worth it. Thanks so much for the WuWus, everyone! My big story ended up getting split into two books, and eventually evolved into four. I never could have envisioned it that way when I started. By the time I’ve finished, I will have spent 8 years with it. Am very much looking forward to trying something “smaller” (no ambiguous endings or recurring characters) next time. 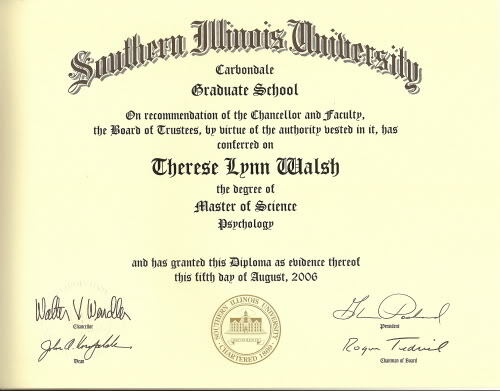 Congrats on the diploma, T.
Yours is one of my favorite success stories, Marsha.